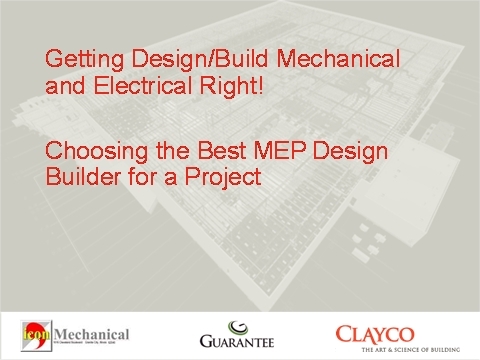 "Getting Design Build MEP Right"
We are excited about our first Mid-Missouri presentation of the year, "Getting Design Build MEP Right". Paul Todd Merrill, PE is a Registered Professional Engineer in 6 states and responsible for planning, design and construction of Clayco's sustainable efforts. In addition, he directs the sustainable design and construction education and training efforts within the organization and has been involved in over 30 LEED certified projects. Arrive at 11:30 to order food from the Pub!